Wesley Woodyard again rotated a good amount of snaps with veteran Keith Brooking. This puts a bit of a damper of W-squared's value. He's still a good LB3 option in most leagues, but it's definitely a situation to monitor. Bengals DE Carlos Dunlap (knee) has resumed practicing, and is expected to make his 2012 debut in Week 3. If you can grab him as your DL4, I would. He's a special talent and has DL1 potential, if healthy and receives enough snaps. Captain Munnerlyn has lost his starting job to fifth-round rookie Josh Norman. Keep a close eye on the Norman especially in deeper CB-required leagues. He put up 8 tackles against the Saints last week and that trend could very well continue throughout the season. The Redskins' defense received a couple of striking blows in Week 2 as OLB Brian Orakpo re-tore his left pectoral DE Adam Carriker tore his quad. Both players are done for the season. The Eagles cut former 2nd round pick Jaiquawn Jarrett. This is good news for Kurt Coleman owners as his job appears safe for the time being. The Bengals benched Taylor Mays last week in favor of Jeromy Miles. Although this benching seems temporary, this has become a situation to avoid as neither player is overly talented nor has the skills to confidently hold onto the starting job. It appears though it's time to stop holding out hope for Darian Stewart. Despite not being on the injury report, Stewart did not play against the Redskins in Week 2. The good news is Craig Dahl has become fairly solidified as a DB2 option in balanced and tackle-heavy leagues. LDE Darnell Dockett (ARI) - You may wonder why I'm recommending a guy who has only 9 total tackles and 0 sacks to his name so far in this young season. Well, sometimes those basic stats don't tell the whole story. Over the course of 2 games, Dockett has 8 QB hurries and 3 QB hits. Chances are that those hurries and hits will start to turn into sacks. He has a fairly soft schedule playing in the NFC West and has shown DL1-DL2 potential multiple times throughout his career. If you have an open DL4 spot in deeper leagues, he's worth stashing. LDE Cameron Jordan (NO) - Jordan's on-the-field play has improved substantially year over year. He's played extremely well against the run and has registered 15 total tackles through 2 games to go along with a sack. Be aware that the high tackle numbers are likely a result of Jordan's above average snap count numbers and that we are likely to see some regression in his weekly production as the season wears on. The Saints aren't nearly as good as they have been the last couple of seasons however, so their defense will likely be in line for more snaps than expected. He's a solid low-risk DL3- option. DT Henry Melton (CHI) - Melton's recent spike in production is leading many owners to overvalue his worth. He hasn't played extremely well in the Bears' 1st two regular season games, he's more so been a beneficiary of great matchups. His string of above average matchups continues this week against the Rams however and he makes for a solid DT1-/DL3- play. Just be cautious of playing him as a "matchup independent" IDP. DT Tyson Alualu (JAX) - Alualu is in a similar boat to Melton. He's actually not played well so far this season but has put up solid fantasy numbers. He plays the Colts this week and has a good chance for a sack. With this said, I would only feel comfortable starting him in deeper, DT-required leagues when he has a top level fantasy matchup. WLB Erin Henderson (MIN) - Henderson was a preseason sleeper of mine and I recommended snagging him as your LB4 in as many leagues as possible. He's gotten off to a great start and has exceeded even my expectations. I think his numbers are for real and that he can put up 85+ solos with a good amount of big plays. WLB Russell Allen (JAX) - Allen had a whopping 12 solo tackles last week against the Texans and will be a viable fantasy option for as long as SLB Daryl Smith is out. I would caveat however that his matchup against the Colts this week is a brutal one and I would still only feel comfortable starting Allen as my LB3 in 14-16 team leagues. ILB Dannell Ellerbe (BAL) - This recommendation is for those in super deep leagues. Ellerbe and teammate Jameel McClain have been alternating snaps depending on the situation with Ellerbe primarily playing on passing downs. With the New England Patriots coming to town, expect Ellerbe to see a good amount of action and rack up 4-6 tackles with a good chance for a sack. SLB Akeem Ayers/MLB Will Witherspoon/WLB Zach Brown (TEN) - All three Titans linebackers deserve mention in this week's waiver wire column. With Colin McCarthy out several weeks with a high ankle sprain, Witherspoon has moved to the middle with rookie Zach Brown sliding to the weak side. The three players mentioned above combined for a total of 30 tackles and should be able to come close to replicating those numbers in the next couple of weeks as the Titans will likely continue to receive a prodigious amount of tackle opportunity. I'd go after Witherspoon first, followed by Ayers, then Brown. SS Michael Griffin (TEN) - I have not been a big fan of Griffin's due to his poor tackling and inconsistent on-the-field play. However, anytime an IDP put up 18 tackles in a game (especially a safety), you have to take notice. Griffin has shown flashes of DB1 potential before with 86 solo tackles back in 2010. Now at strong safety, I think he can break 80 solo tackles again considering how many tackle opportunities he's likely to receive this season. SS Madieu Williams (WAS) - An injury to Brandon Meriweather has opened the door for Williams to step in and take the reigns of the starting SS position in Washington. He posted 7 solo tackles last week and I wouldn't be surprised if he continued that type of production into next week and beyond. This specific position has proven to be a fantasy goldmine over the last couple of seasons. Williams' teammate, DeJon Gomes, is also worth a look. CB Buster Skrine (CLE) - The suspension to Joe Haden and injury to Sheldon Brown has left the Browns incredibly thin at the cornerback position. As a result, Skrine, a 5th round pick out of Tennessee-Chattanooga, started last week and posted a respectable 7 solo tackles (as he did in Week 1). Skrine is a below average CB and teams will continue to harass him. As long as they do, I'm scooping Skrine up as my CB2 in CB-required leagues. 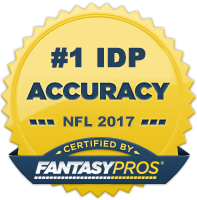 Bad starting CBs equal great fantasy IDPs. CB William Gay (ARI) - The Eagles have been a top 5 matchup for CBs this season and you can bet your bottom dollar Gay will be thrown at a ton this week. The Eagles pass A LOT and Michael Vick will be looking to avoid throwing the ball Patrick Peterson's way. This will translate into a lot of tackle opportunities for Gay who already has 12 total tackles (10 solos) and a FF on the season.